If you’ve ever been in therapy, you may have wondered how just talking about your problems can affect how you think and feel for the rest of your life. You may also wonder what is going on in your therapist’s mind. This brilliant book illustrates how the process of therapy—the long, sometimes tedious concentrated attention to core conflicts—actually alters the shape of our neurons, modifies the connections between nerve cells in the brain, and effects permanent changes in how we interact with the world. Dr. Susan Vaughan, a superb writer, takes you behind the scenes of the fifty-minute hour, and tells you what the therapist is thinking while the patient is talking. A psychoanalyst and a scientist, Vaughan interweaves stories from her sessions with findings from research. She shows how free-associating, interpreting dreams, and paying attention to childhood experiences have an impact on the structure of our anatomy. Just as repeated exercise can change the shape of our bodies, so can repeated attention to our conflicts, in the course of our work with a therapist, alter the shape of our minds. This book is a boon for patients who wonder why therapy works, and for therapists who know that it works but don’t know what it does to the brain. Now, armed with a scientific basis for its effectiveness, therapy can emerge from the shadow of Prozac. 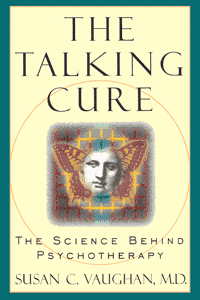 The Talking Cure is a powerful amalgam of the skill of the therapist and the science of the brain, wonderful to read and exhilarating to understand.